So anyway, as I'm moving into my last 6 week surge of miles, I'm due for some different variety. 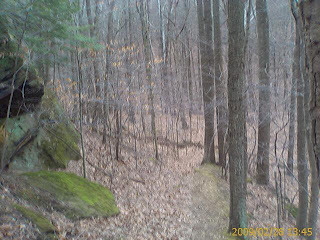 This week, I'm hoping to get down to Dillon State Park and learn some of those trails to get away from my mundaine mileage at Blackhand Gorge. 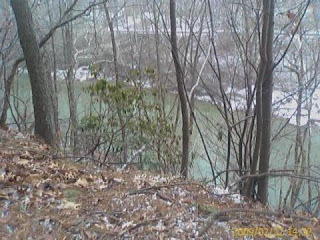 I love Blackhand Gorge, but I only have 3 real options for mileage and I need more. 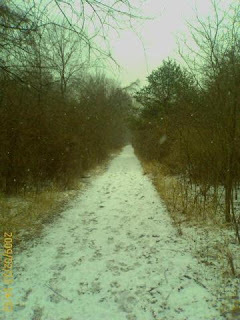 I don't like running on pavement that much, and since most of my 2009 race schedule is all trail races, I really need to put my training in on the trails, not the road. 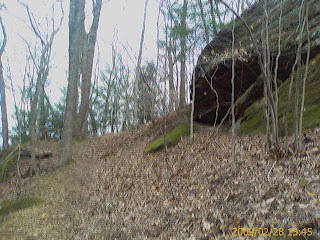 I'm scheduled for a 22 mile long run this coming weekend and I'm hoping get up to Mohican and run with some trail buddies on the Red / Green loop. Rumor has it that they're awful purdy. I'm also planning to get in a few long night runs this week as well, because I got some new reflective gear along with lots of new energy jelly beans, shot blox, and oodles of different flavored gel packs. I'm anxious to try some of the new stuff out; silly but true. Oh yeah, on our little shopping excursion this week (when I got all that cool stuff), we all ended the night at this nice place called Hoggies Barn and Grill up @ Polaris and it was AWESOME!! We all gorged on way too much food and had a blast. 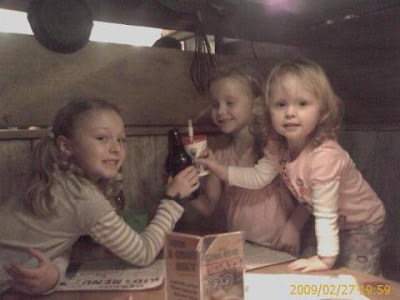 Below is a pic of Lizzie and Jazzy drinking their first bottle of Rootbeer at Hoggies. Daizi had milk, of course. Lucas, I am glad to hear your training is going well. We all need some of those slow weeks in fact most training plans call for them. Your doing great! Don't get lost out there this weekend! Oh I almost forgot. I tend to carry my big bulky Zune on these runs. I usually keep it inside a pocket and it never freezes up on me. I've also ran a marathon, with my iPod, where the wire cord froze solid, but the iPod still functioned. Maybe it's you!